Simplicité pillar candles make beautiful decorative additions to the bedroom and provide a romantic lighting when you want it. To decorate your bedroom with pillars, place the candles on shelves, shelf-style headboards, dressers, vanities, bedside tables and even on the floor or windowsills. 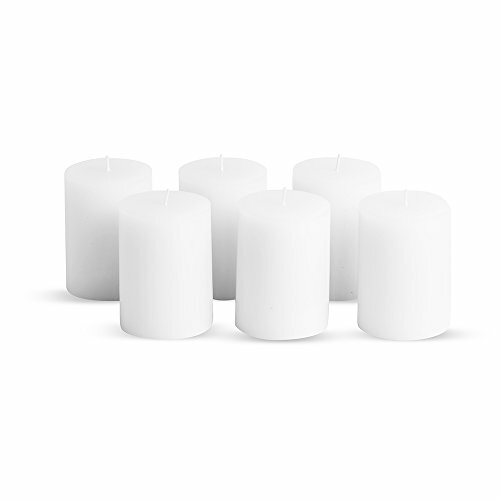 Several candles of various sizes placed together, add romance and make your Home more alluring. Place multiple pillars candles to create a layered look in the fireplace or the bathroom. HAND-POURED WITH CARE AND NOT PRESSED - These candles are created by and for those passionate about remarkable candles. Our candles are not pressed and dipped into colour but hand-poured by expert candle makers in small batches to ensure the highest quality pours. EXTENDED BURN TIME - Proprietary combination of the cleanest burning premium wax blends, all cotton lead-free wicks allow our candles to burn cleaner and for a longer duration as compared to any other candle out in the market. PERFECT GIFT FOR ANY OCCASION - These premium Candles are carefully hand-packed in our signature premium gift box. Whether decorating your home, planning a dinner party or for that special wedding this box set will ensure you have an ample supply of pillars at a great cost. We provide full refunds & returns if there's any problem after receiving the product. If you have any questions about this product by Simplicité, contact us by completing and submitting the form below. If you are looking for a specif part number, please include it with your message.